With the release of the sixth season of Smallville and the DC Universe animated film, Superman - Doomsday, it's a good week to be a fan of the man of steel. 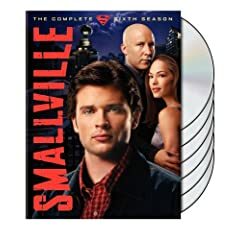 Other television DVDs out this week include the third season of Boston Legal, the final season of Everybody Loves Raymond, and the third season of Stargate Atlantis. Notable feature films available on DVD this week include The Camden 28, Beyond the Gates, and The Boss of It All. Animation fans can pick up the fifth volume of Family Guy as well as volume 2 of The Best of Rocky and Bullwinkle, not to mention my favorite cartoon release of the week, the entire Josie and the Pussycats series. A Polyphonic Spree live show highlights the music videos out this week, along with a live performance by folkie Bert Jansch and a U2 show from the band's PopMart tour.